Pork loin chops, seasoned with paprika, sage, thyme and spices then lightly pan fried and served with homemade applesauce. When my applesauce was simmering in the crock pot, I knew I would be serving it with pork chops. I served them with buttermilk mashed potatoes and an Autumn Salad with Pears on the side. You can make this with boneless or bone-in pork chops; center cut pork loin chops are a good option because they are pretty lean, just be sure not to over-cook them so they don’t dry out. According to the USDA, cooking pork to 145° F and letting it rest for three minutes will give you juicy chops that are safe to eat. Pork loin chops, seasoned with paprika, sage, thyme and spices then lightly pan fried and served with homemade applesauce. When my applesauce was simmering in the crock pot, I knew I would be serving it with pork chops. I served them with buttermilk mashed potatoes and an Autumn Salad with Pears on the side. 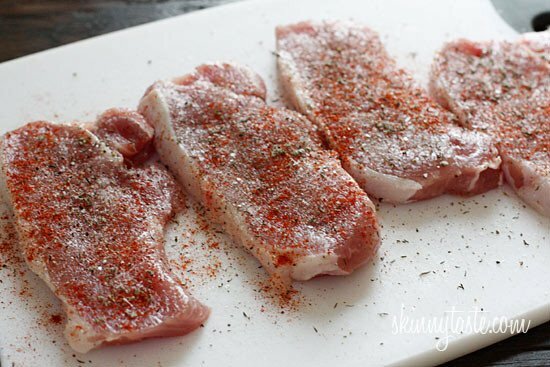 Season pork chops with paprika, garlic powder, sage, thyme, salt and fresh pepper to taste. Place flour on a small flat plate and lightly pat the chops with flour, shaking off any excess flour so they are lightly coated. Heat a large skillet over medium heat and add butter when the pan is hot. When the butter melts, place chops in the skillet and cook 3 1/2 to 4 minutes. Turn over and cook an additional 3 – 4 minutes, or until the internal temp is 145° F.
Remove from the pan and set on a platter to rest for three minutes. I made these tonight for dinner and they were so good! Thank you for another amazing recipe. Question- how do you recommend reheating them? I would probably microwave them. Careful not to dry them out, so glad you liked them! Made this last night. Has to be my favorite way to cook pork chops. It was very good! Juicy!! I made this last night for dinner, and my kids loved it! My six year old actually said yum with every forkful! Will definitely have to make this more often. Love when the kids enjoy it too!! Yum, I really want to try this!! Unfortunately my boyfriend doesn’t like pork. I’m sure I could substitute his for chicken, but would it be weird to serve the applesauce with chicken? Or should I just leave it off his plate? Do you hear up applesauce? 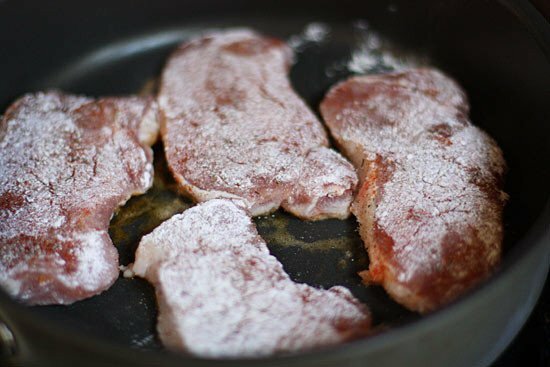 My chops came out dry…I don't know if they were too thick or if I cooked them too fast. I will definitely try it again with thinner chops. The drippings, however, made a nice gravy to put over the chops so they didn't seem dry! Try try till you get it right! Sounds like they cooked too long. Delicious and recommended! Tonight is my time using this recipe in less than 2 weeks. Replying to my own post for a correction. It should read "Tonight is my SECOND time using this recipe in less than 2 weeks." I just got done cooking these, but when I flipped them they kinda stuck and the brown crunchy part came off. What can I do different? Love ur recipes they are so yummy and glad they are healthy. Thanks for the yummy food!! Usually my family makes pork chops with nothing but seasoned salt for the seasoning but we gave these a try last night. My husband and nine year old son are VERY bland eaters and preferred the old way (although they did eat their meal) but I LOVED the seasoning combination in this recipe. I'll definitely be making mine like this in the future. Loved these! We were skeptical of the applesauce with the chops but was DELICIOUS! And so tender. We will definitely be making these again. 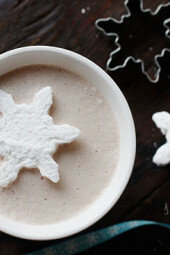 These were awesome — and so easy to make!! 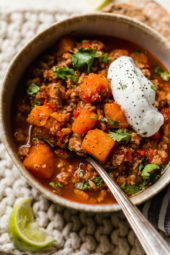 Awesome recipe, my husband loved them (so did I)! He couldn't believe they were from a website called "Skinnytaste." Thank you for the yummy recipe! Made these tonight and they were DELICIOUS! Subbed Old Bay for paprika and basil for thyme (didn't have any), but they were so good. My husband says he doesn't care for herbed pork…he does now! They came out good…not a huge fan of pork- everyone else really liked them! I'll try them on the grill next time. I did something similar …adobo, dried oregano and cilantro, packet of sazon, fresh garlic and a little olive oil. Marinate for about 30 minutes then I put in 250* degree oven for about 15-20 min then broiled on each side about 3-5 min or just when start to brown. So moist and yummy flavor! If I were to get my pork loin chops made out of a pork loin (on sale at Publix this week) how many inches thick should I ask for? 1/2 inch? Sorry, I read the values closer and saw the applesauce listed there. Sorry about that. Does that 4 point value include the applesauce listed under the ingredients? This turned out EXCELLENT! Even my picky boyfriend loved, though he thought the apple sauce was "weird" but it was still great without it! I will for sure make this in the future! Everyone LOVED it!!!! My husband said it was the best meal I have ever cooked… We also had sweet corn on the cob..YUM!!! Thanks for the great recipe!! Made this tonight, and my 2 year old kept asking for more! Thanks so much!!! This was delicious! I used smoked paprika instead of regular paprika, but I'm sure it's great with normal paprika too! Made this last night very very good. I too didn't have the dried sage but I did have the Thyme and it was delish…. These are awesome! Super easy and fast. I didn't have the dried sage and thyme so I subsituted poultry seasoning. My family loves these all the time! My kids are picky eaters when it comes to meat but this is their favorite. I get no complaints. Thanks so much!!!!! Yum… I tried these tonight, SO good! I need help. 2nd time back on WW and want to make it all right this time. 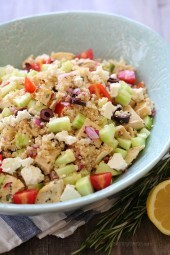 I found this recipe and it looks awesome but when i put the ingred in ww recipe builder comes up 6 pts. what am i doing wrong? These were great! thanks for a making and ordinary pork chop so delicious for us! Can't wait to try more of your recipes! We made these tonight and they were so good. My porkchops are often dry but these were perfect! Thanks! This was what was for dinner tonight. Super yummy and real easy to make, even my 6 year old loved it! Thank you so much for sharing such a great, comfort food light recipe! 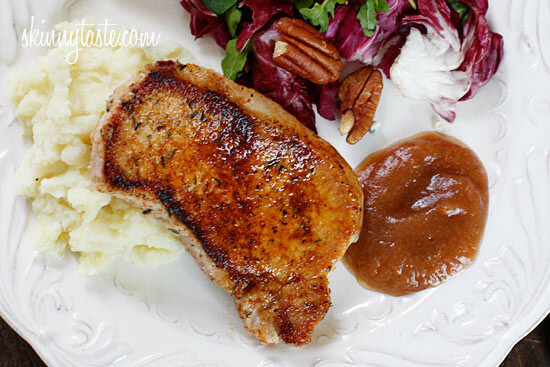 I never thought to make my own applesauce, it really brightened up my old pork chop standby. Thank you!! I loved it!! Making this tonight with your makeover corn casserole and roasted broccoli! It is a Skinnytaste kinda night!! Thanks for being fabulous!!! I love that this meal (with your skinny mashed) is so quick to make but feels special! I will definitely be making this more often! Pork Chops were delicious, even my picky 5yr old ate them up. Made this tonight excited to try if. We have loved all your recipes I even got my sis in law hooked! these are delicious. thanks gina! making this tonight with roasted acorn squash as a side! perfect fall dish for Halloween! i am making this tonight with the crockpot apple sauce and mashed potatoes! i can't wait!! thanks gina! I made this last night for supper, except I used your pumpkin butter instead of the applesauce. Delicious! I didn't have any sage, but I didn't really miss it. You can just leave the sage out, add more thyme. I made this last night and it turned out great! 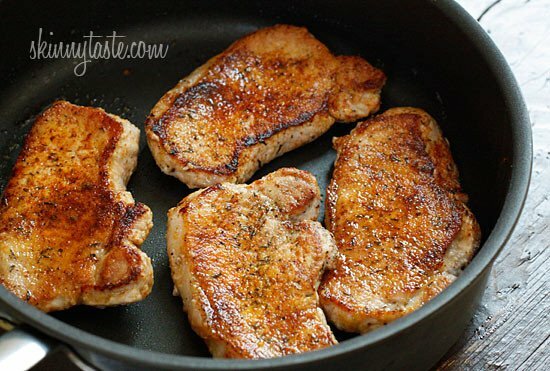 It's always hard to know what to do with those thin pork chops so they don't dry out! I'll definitely be making this again!! The only think I noticed is that my second batch came out better than the first because the pan was hotter. Are there any good substitues for the sage? I think I have every herb but that one! Brady Bunch is the first that popped into my mind when I saw it. Then my mouth started to drool. I can't wait to try these. This Will Be Dinner Tonight! My Dad LOVES Applesauce With His Porkchops. He Is Very Picky And Has Loved The SkinnyTaste Recipes. Thank You For Helping Me Find Healthy Foods My Picky Diabetic Dad Will Eat! Sorry for teasing you, I haven't posted the buttermilk mashed yet but it's coming soon. The salad recipe is linked above. Lots of Thanksgiving side dishes coming soon! Anonymous asked for mashed potatos. It wasn't until her thank you to Gina that she mentioned buttermilk ones. Great recipes this is going to be dinner tomorrow night. 2 thumbs up. I couldn't find the recipe for buttermilk mashed potato either. There is one with garlic but it has sour cream, not buttermilk. Would love it if you could post the buttermilk one. Thanks!!! I made these tonight but substituted your spices for old bay, a southern favorite! They were amazing! I also made your apple sauce. I thought it was great! My husband said I used too much spices! Oh well, you can't win them all! Gina thank you so much for ALL your great recipes! Do you have the salad recipe here as well? Thanks. Love the spice blend on this pork and can't wait to try it. For some reason I always forget to make pork but this looks delicious. Oh those look amazing! I need to make pork chops more often!! Thanks for the recipe! 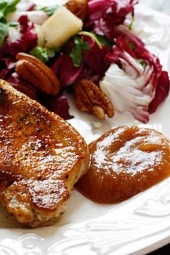 Porkchops and applesauce is one of my favorite fall entrees! Thanks for sharing a new flavorful take on it! Looks yummy can't wait to give this a try, thanks. Thanks, Gina! I found the ones that were garlic but not buttermilk! I love garlic so that works out! Thanks again! Ever receipe I've ever tried has been amazing! My momm sister, and friends now use your website! Too funny, I was coming to the site to look for a Pork Chop recipe and it was right in front of me! Thank you! Pork chops and applesauce, so American! Lol about the Brady Bunch episode! Yes, the chops weighed 3.5 oz each, 14 oz total. And yes, I have mashed potatoes, do a search at the top right for skinny mashed, it should come up. This looks (and sounds) so GOOD! I have been getting so tired of chicken and really need something different. This is great, I don't know why I didn't think of it myself. Thanks!! I am 4-for-4 using your excellent recipes this week: sesame crusted chicken tenders, the roasted peppers, onions, potatoes, and sausage dish, the broccoli mac and cheese, and the chicken cordon bleu. 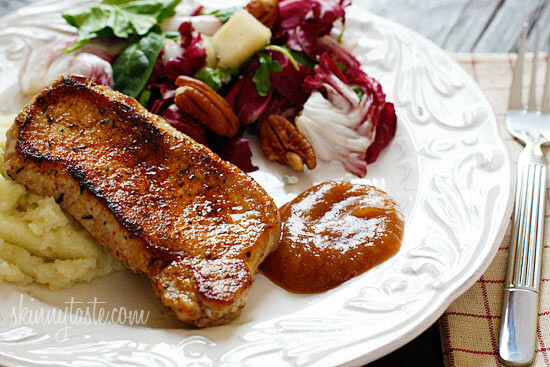 I cannot wait to try the pork chops paired with the autumn pear salad! Looks delicious! I will definitely try this one! I can't say this enough and find myself saying this everyday to you through the screen…. I LOVE LOVE LOVE you! This looks mouth watering! My boyfriend just mentioned he loved Pork Chops with Applesauce and I thought he was crazy…never heard of applesauce with meat. lol. Do you have a receipe for mashed potatoes? I've looked and looked but couldn't find one. Thanks! are the loin chops supposed to be 3.5oz each then? 14oz for a total of 4? That looks so good, but I'm always so nervous to cook pork. I might have to put my nervousness aside and try this because it looks really really good. Definitely started drooling at my desk. Can't wait to try this recipe out! This looks really good!!! It's going on my next menu plan! On a side note – the post title brought me back to a particular Brady Bunch episode where Peter Brady must have repeated that phrase a dozen times. LOL. Hahaha, too funny. I was looking for a Brady Bunch reference in the intro to the recipe. I'm glad someone mentioned it down here.